The Body Shop Discount Codes! Now that I have booked my holiday (I REPEAT: I have finally booked a holiday!) I am busy sorting out the items that I’m going to take with me. One of them is The Body Shop’s Moringa Beautifying Oil. It’s a beautiful dry oil for face, body and hair (though personally I wouldn’t put it on my face) and it contains cold-pressed moringa seed oil as well as kukui, sweet almond and marula oils. 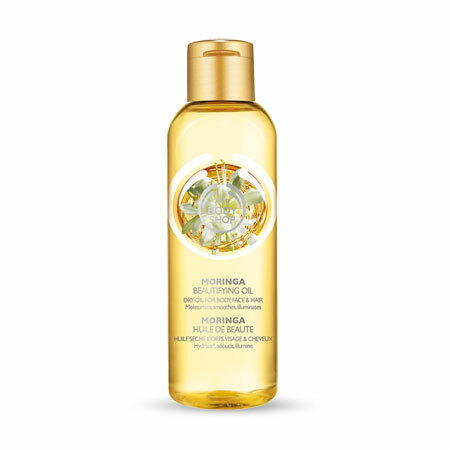 It’s a really, really nice body oil – easy to massage in, light-textured, beautifully-scented. As a post-beach oil, it works marvellously – there’s very little greasiness to the finish so you don’t stick to your clothes or feel smothered. Emma Hardie fans will be disappointed that this isn’t a more affordable “dupe” of her Moringa body products – unfortunately the scent bears little resemblance. But it’s still nicely summery and faintly exotic, and it’s in a plastic bottle which makes it perfect for when you’re travelling light. It’s £9 for 100ml here. There are a few matching products for the oil, including a body butter and a body mist spray – the body butter has the usual excellent Body Shop consistency, I haven’t tried the mist. I really want to stock up on some old classics that’ll take me down memory lane, so I’m off to browse the Banana Shampoo and Satsuma Shower Gel! For the discount code, go to The Body Shop and it’ll be on the homepage! The codes work until the 23rd July 2012. Previous Post End of the Sales. Sadface.